I usually opt for fiction to gain understanding and empathy for topics that are far from my own experience, but sometimes I come across works of nonfiction that are just as moving. I found Homes to be especially powerful, perhaps because the story is told from the perspective of the boy who lived it. In 2010, because of religious discrimination, Abu Bakr and his family (including 7 other children) moved from Iraq to Homs, Syria in hopes of a safer life. But it was not long after, when Abu Bakr was 10 years old, that civil war broke out on the streets around him, marking the beginning of his father’s attempts at moving his family again – this time with the help of the UN. It wasn’t until the end of 2014 that the family was escorted to the airport and on to Canada, where they made their new home in Edmonton, Alberta. Most of the book tells us of the family’s years in Homs, the unpredictability of the violence and the effects it had on Bakr as a child. One thing I love about this book is that it shows how life can be good and bad at the same time; the terror of growing up in a war zone mixed with the joy of being with family or hanging out and playing soccer or video games with friends. Bakr also helps us to understand that coming to a new country – one that is going to be so great and wonderful and safe – is much harder than we might think. Everything is different, there is so much to learn and get used to; a new language, new schools, new people, new friends to make, and a homesickness for the country they have known and grew up in, despite the fact that it is no longer safe. And all the cousins and aunts and uncles left behind makes it even harder. There is homesickness, but also guilt about the fact that they made it out while others did not. This is one of the reasons Bakr felt compelled to tell his story. He wants people to know that their family is not defined by war. He had a traumatic childhood, but also a happy one. He witnessed car bombs, but he loved to play soccer. He had to start over again in a new country, but he has his family and his future. When people in the West hear ‘Iraq’, they instantly think of Saddam Hussein and the Gulf War. But when I think about my home country, I remember the honey-drenched baklava my aunts gave me, the pinches on my cheeks, affectionate tickles under my chin, and coos of laughter. In my twenty-six days in Canada, I had not heard or seen a single bomb or gun. There was no fighting, no war. I was glad to be here, to be safe. Some kind of impossible knot inside me had released but now, I was just a different kind of afraid. I had prayed so long for safety but now, I felt ungrateful and ashamed and I couldn’t help it. The backs of my eyes started to sting and I clenched my teeth because I didn’t want to start my new life with tears. Soon after reading Homes, I read The Boat People. I knew it was about a boat full of refugees hoping to seek asylum in Canada, but it hadn’t occurred to me that I was going to find so many similarities between The Boat People and Homes. I was struck by the similarities of the descriptions of violence and terror in both books; one a nonfiction book set in Syria, the other a novel partly set in Sri Lanka. Mahindan and his son are on their own in The Boat People, but their relationship and experiences reminded me of Bakr and his father. The difference? Bakr and his family arrived in Canada by way of the UN and the “proper” route of immigration. They were lucky to be able to travel to Damascus and apply for asylum in another country. Mahindan and the other 500 refugees that came to Canada in a boat were desperate – most of them had no other way out of their country. So they took a chance on being let into Canada. Unfortunately, at the time, Canada was worried about being seen as soft, and the refugees were detained for many months and some were even sent back after hearing everyone’s claims, case by case. I found this process interesting to read about in The Boat People. Sharon Bala takes us through it from different perspectives; from the point of view of Mahindan, his son and the other refugees; from Priya, an law student whose parents are Tamil and immigrated to Canada before their children were born; and Grace, one of the adjudicators in the process, a Japanese-Canadian woman who has been influenced by a politician who would be happy to see the Boat turned around and sent back. Grace’s perspective of the story fascinated me the most. Her job seemed impossible to me – having to make life and death decisions about people’s lives with very little (or no) evidence. I could see how easily influenced a person can be depending on their experiences and what they’ve been told going into a situation. In addition to the stress of her new job as adjudicator (one she didn’t seem entirely qualified for) and what she had been told by her political friend about not wanting to let terrorists into the country, Grace had her mother continually arguing that the Boat Peoples’ circumstances were no different than Grace’s grandparents’ as Japanese-Canadians during the war. And she couldn’t help but compare her own daughters’ comforts and privilege to the children from the Boat. I was deeply curious to find out how she would handle things as the story went on. These girls had been born into a country at war, in a place where children were given guns and taught to fight, where girls strapped on explosives and turned their bodies into weapons. A place where ‘suicide bomber’ was the highest possible calling. They had lived unimaginable lives. While all the violence Meg and Brianne had ever known was confined to a video game. Not long after the Tamil Boat People arrived in Canada in 2010 (the ones on which Sharon Bala’s novel is based), this article was written for the Literary Review of Canada, explaining The Rights of Refugees in Canada. Refugees are not as big a problem now as they were in the war years, or in the years immediately after communism ended. But they have become a leading political and media issue in almost every western state, in large part because every country nowadays believes its system is too soft and it is therefore being taken for a sucker. The point about the unhappiness that may accompany the safety of a new country is well made. I remember hearing about refugees deciding to return to Syria from Germany and being amazed but it seems that the pull of home (and of course family left behind) trumps fear. I would once have been more amazed than I am now at hearing about returning refugees. Reading “Homes” you can just feel the loneliness and anxiety of being in a new country. Like he said, it’s a different kind of fear. So neat to see your reviews just now — I’m writing a short article about books that speak to the refugee crisis, and Bala’s novel is one of my picks! (I had a quick look at the other articles you link to and luckily I don’t overlap with them at all. Whew!) And although it’s about immigrants in general rather than refugees, our buddy read of Small Island has been very timely for thinking about what it’s like to settle in a new country, the reality vs. the expectations. 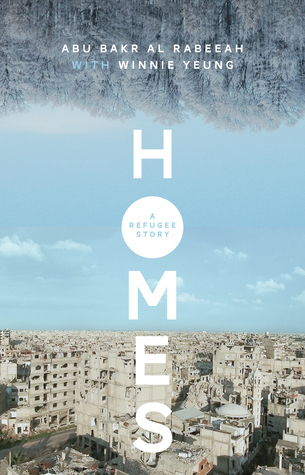 I feel like I need to read more nonfiction from the perspective of refugees. What good timing! Will you be posting about your article once it’s done – I’d love to read it! I’m looking forward to reading your article too! 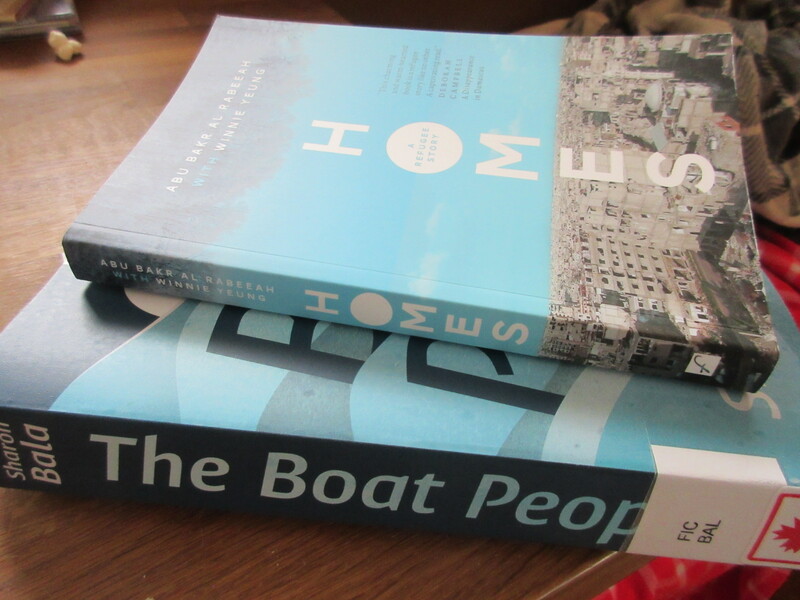 HOMES and BOAT PEOPLE make for a thoughtful and timely pairing! Great review. I appreciate that you included links to articles and books for further reading. I loved Boat People and how it explored issues that refugees face before they leave and when they arrive. I look forward to reading Homes. I liked The Boat People even more than I was expecting to, after continually hearing how “important” it was (which put me off a it). So I’m glad I read it anyway. And if you liked that, then you’re sure to like Homes! These both sound good. I’m especially drawn to Homes and what Bakr said about how Westerners often view places like Iraq, as only war-torn desert landscapes and not places where there are shops and restaurants and family gatherings and schools and all the trappings of everyday life. Thanks for sharing these! That was something I really appreciated, too. It really gives you a sense that these places are homes to people just like our own countries. If they are leaving, it’s not because they *want* to but because they *have* to. The comparison between these two books seems very interesting. I’ve seen the Boat People around but hadn’t heard of Homes, which sounds very good — there have been quite a lot of Syrians who’ve immigrated to Alberta — we had neighbors flown in but unfortunately their adjustment was difficult and they have since moved out of our area. Thx for the links at the bottom: I enjoy their lists and have read quite a few mentioned. The family in Homes are living in Edmonton. I really like how you paired these two books. As you know, I loved the Boat People, but now I really want to read Homes! And what a powerful quote you included at the very bottom, I think people tend to forget that the Syrian War is just one war in a history of wars that our world has experienced, and taking in refugees is a part of our heritage, something we will always have a duty to do as Canadians. 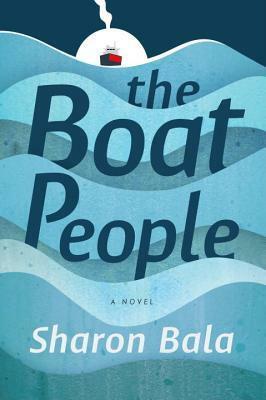 Your glowing review of The Boat People is what kept me motivated to read it… after Canada Reads was over, and some readers has negative things to say about it (mostly about the end, I guess, although some had a hard time getting into it). Anyway, I loved it right from the beginning. So thank you! Where do you stand on the ending? I know right-we should all be soft, the world would be a much better place. I have only read The Boat People but really appreciate your review of both books and the discussion of the similarities. I almost felt like The Boat People was non-fiction and really wish that there was more so that I could learn of Mahindan’s fate in Canada. Sad to read in the news that one of the refugees on the boat was a victim of Toronto’s recent serial killer. Oh, I didn’t know that. How awful! It’s crazy how we just keep cycling through wars, hemming and hawing about whether the refugees are worthy to be taken in, despite knowing the genocide they face in their home countries. In the 70s, it was people from Cambodia and Vietnam. We know they don’t want to come to Western countries just for the sake of doing so, but because the other choice is death. It *is* crazy, isn’t it? I wish the world was the kind of place where we could just open up our borders and pass freely. I read The Boat People and loved it! I totally agree that Grace was one of the very most intriguing characters. I hated the fact that she was quite obviously pushed into this position simply because she would be a political pawn in this game of immigration/migration. I loved the way this depicted the true difficulties in dealing with immigration and the lack of documentation in other countries from which people are escaping. I have yet to post a review on my blog, but hope to do so! And Homes sounds interesting and inspiring! Nice post as always! I’m glad to hear you loved it, Lynn. I felt bad for Grace – I don’t think she knew what this job she was offered was going to entail. I’d be a basketcase at the end of it all! Great reviews – I want to read both of these now. I just read Yusra Mardini’s “Butterfly” – she’s the Syrian lady who came to Germany via a boat across the Mediterranean, wrongly described as pulling it the whole way, and swam for the refugee team at the Rio Olympics. It’s very moving. I haven’t heard of “Butterfly” – it sounds like one I would love to read. Thanks for letting me know! Half my review done, it should be out later today …. These both sounds like really good and important reads. I’ve not read many books about the immigrant and/or refugee experience and that’s a gap I’d like to fill. I think you’d especially like “Homes”! How fortuitous that you ended up reading these back-to-back! You already know how I feel about The Boat People (all good things) and now I can see that our responses to Homes were very similar as well.And what a fantastic idea to cover them together! I love the lists of recommended reading you’ve included. The one discussed in the CBC article which I really enjoyed, and found rather different from many others, was Tasmeen Jamal’s Where the Air Was Sweet; it was really engaging and told a story which I hadn’t heard before. The Lithub list has soooo many titles on it that I want to read, and it also reminded me that House of the Spirits by Isabel Allende counts (as the storyteller has, since, fled Chile to Venezuala, which I’d forgotten – love that book). And the Signature list reminded me that I really have to make time for some of the books which appear on *both* lists, which now feel like real gaps in my reading, (the Chabon, the Eggers), but Signature’s list also reminded me how much I enjoyed Camilla Gibb’s The Sweetness in the Belly (which was the book which took me to Eritrea for the first time on the page). So many great reading ideas on those lists for us: thanks! I have been itching to read Where the Air Is Sweet for a long time now (partly because of the great title, I have to admit). It’s good to know you liked more than the title! and that it told a story you hadn’t heard before. I also learned a lot from Sweetness in the Belly. And would love to read many from the lists! Good thing I like making lists, even if I’m not able to read through them all!